The best way to spread festive cheer is by giving the people what they want: delicious food. Since Christmas is the season for giving Chef Chathurika Anuradha of Knorr fame shares some traditional as well as unique recipes and tips with us on how to prepare a Christmas menu that will satisfy even the crankiest of Christmas Grinches! “People do tend to stick to the authentic cuisine though they also like to experiment with trendy dishes. For example the roast chicken is a must on any Christmas menu. I believe that the menu should be designed according to your family’s palate. You are the executive chef in your kitchen and you know about your family’s preferences best. I always believe that whatever occasion you are cooking for, you need to add love to your food,” Chef Chathurika said with a smile. She notes that there is a vast selection of dishes to choose from. You get roast chicken and roast potatoes included in the Christmas menu. Then you can move onto the bakes. Sweet delicacies like the Christmas pudding will follow. “Stick to a simple but delicious range of dishes,” she advised. She says that the Christmas cake is the most traditional item in the Christmas menu. However she notes that people are buying a lot of ingredients to substitute items in the traditional Christmas cake recipe. “For example they replace almonds with cashew. They also include pumpkin preserves. The Christmas cake has taken a lot of innovative twists. Being creative is fine as long as you know the values of these authentic dishes. If you can replace certain flavours without harming the original recipe, then that is ok,” she said adding that as chefs they are always trying to create new dishes and flavours to cater to the customer’s taste. Rich food oozing with tantalizing flavours make it to the table during this season. Most of these are high calorie food. “Rich food pleases the tongue but at the end of the day, if you do not lead a quality life, then all the value is lost. One option you can take is to reduce the amount of sweet dishes in the menu. You do not need to add much oil. You can take options like stir frying the ingrediants. Just add a bit of oil or sugar only to get the correct textures. Also keep tabs on the quantity you need to consume. There is no way you can avoid these dishes when you are out visiting relatives or friends or dining out during this period,” she said. Since Sri Lankans consume rice as their main meal, they tend to include festive rice dishes in their menu. Roast potatoes with herbs, battered vegetables, salads and soups are popular in European countries. She says that everything is available now at your fingertips to purchase from the market. However it is questionable whether the love that is found in home cooking is added into those dishes. “They also add a lot of artificial flavours and preservatives into these products. A lot of people tend to serve food they have purchased from outside but there is no love or commitment in those items. Nothing beats the happiness you feel when you keep in mind that you are preparing those dishes for your loved ones,” Chathurika said. She elaborates the value of convenient methods of cooking adding that it is possible to whip up quick but delicious treats for visitors within a short span. “Mix butter or a fat spread with chopped curry leaves and curry powder and prepare a spread. Toast some bread and spread the mixture on it. You can serve this with a spinach and dhal soup. This will be a refreshing experience for your guests,” she noted. Creative punches made using tea is another innovative manner in which you can serve your loved ones. “Tea goes well with sour flavours like mint or lime. You can top this up with some ice cubes. We normally serve our guests with a tea or coffee. This will be a delightful surprise for them,” she added. Chathurika says that there is no need to spend huge sums on making innovative meals. You can prepare mouthwatering treats with what is available at home. “You can take out a piece of chicken from your chicken curry, shred it and blend it with some chopped onion and garlic, you can serve this on a toast or cream cracker,” she said. The manner in celebrating Christmas has changed though it has not lost its values. There is more festivity and celebrations today than in the past. Queried on what is the most frequent culinary mistake that she has come across in Christmas cooking, Chathurika says that most people are into fusion cooking these days. “They don’t know the correct proportions. One handy tip I would like to give to our housewives this season is to follow you natural instincts. For example to get the golden colour on your roast chicken or duck, look for the ingredients which make that shade on your spice rack. Combine one or two pinches of turmeric and chili powder together and add that to the chicken before baking it. Instead of using oil, you can add a bit of sugar for the glaze,” she opined. She adds that you can use protein packed items like tofu, dhal and spinach if you are cooking a festive meal for a vegetarian or vegan. “There are a lot of vegetables you can use in your cooking. The only thing you might lose is the flavours but you can still make a delicious and nutritious meal for vegetarians with these ingrediants,” she said. Armed with 11 years experience in the field Chathurika has a passion to create new flavours and dishes. She had previously been in the designing sector. “I realized that I can play a bigger role in the culinary field. I changed my profession at a time nobody would take such a decision. Since I have the designer in me, I believe in my power of creativity,” she smiled adding that she is still a learner and that she keeps on upgrading her knowledge. Though Chathurika’s mother has been a Home Science teacher she says that she did not possess the passion of cooking during her school days. 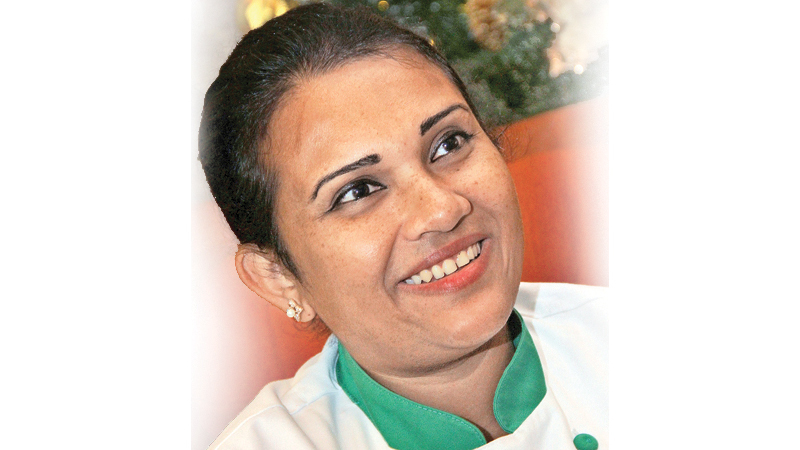 She trained at Win-Stone School of Culinary Arts and is a member of the Ceylon Chefs Guild. “If you can infuse the excitement of Christmas into your everyday lifestyle, then everyday will be a Christmas day for you. Love should be spread throughout the year and not only limited to the Christmas time. If you can celebrate that spirit within your heart always, then I think God will always be there with you,” she concluded with a smile.